I love children's books! Part of the reason I love children's books is because they often boil down this huge life stuff we're still facing as adults into easy to understand terms and are very gentle about it. I don't mean that they dumb stuff down, I mean that they are age appropriate and loving and get to the essence of things. I feel like children's books are often written with so much love and I don't know, I just like them! 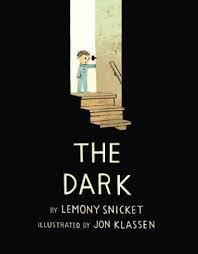 So it's no surprise that I loved The Dark by Lemony Snicket and illustrated by Jon Klassen. Laszlo is afraid of the dark, but the dark is everywhere. It's always lurking in places and while most of the time he can ignore it, he knows it's there. Then one night the nightlight goes out in his room and the dark comes to visit him. Maybe the book over explains its point on one page, but the story beautifully illustrates that while there is darkness in life, we can use it to to better understand and find the light. And it's also a story about how Laszlo faces his fear and no longer has to be afraid. It's pretty great, to be honest! Plus the language is very pretty and the illustrations nicely evoke that feeling of being in a big kinda creepy house. So my verdict is that this book is a winner and also that I still love children's books even though I'm practically an old lady now. Many thanks to Little, Brown for sending me a copy of this book.